Since I have Hungarian ancestors named Weiss, as a kid I liked to imagine that I was related to escape artist Harry Houdini (Erich Weiss). Evan Andrews at History in the Headlines asks, What Killed Harry Houdini? 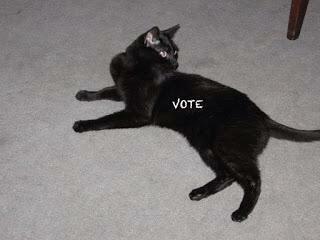 If you are registered to vote in the U.S., Schrödinger the Cat urges you to vote on Election Day, Tuesday November 8th. He's not allowed to vote, but if you are, do so.